Home Petro-addiction Bodily and Planetary Health in a World Out of Control - Too much to ask? As a long-time observer of environmentalism, peak-oil based survivalism, and yearnings for peace, I find that two reasonable wishes have become the common denominator: (1) to be healthy, as one attempts to navigate the toxic present, and (2) to hope that the climate can be stabilized. A third wish, often at the top of the list, is to see one's personal material security be elevated as times get rougher. This urge is common for isolated consumers, and understandable in our crises-wounded world. But without community and cooperation, there is no future in striving for or achieving personal success. Ten years ago, one could reasonably say, "I'll take care of myself and not live so long as to suffer the crash down the road." This strategy is being eaten away like a sand castle that crumbles when the tide comes in higher than it used to. It is a huge struggle to be healthy when modern living has to be built around avoiding pollution, addictive substances, getting hit by cars, and having too much stress. The effort to be fit and attractive is admirable and even enjoyable, as in meeting a challenge. One can go further by getting on the local-food bandwagon and generating less non-recyclable trash. However, when one tries to separate one's own health and happiness from all other people, whether because of selfishness or inability to help anyone but oneself, the effort leaves no legacy -- except to inspire a few others to take better care of personal health. Planetary health has steadily deteriorated in the past several decades, if we look at significant statistics on rapid loss of biodiversity, disappearance of oxygen-giving forests that moderate precipitation and temperature, topsoil loss, the plague of plastics and radioactive waste, enough uncontaminated water for drinking and agriculture, and other critical measures. The pace of deterioration is rapidly increasing as our numbers increase, and the wealth-redistribution many hope for may not address aggregate waste. Extreme weather events caused by global warming and changes in wind patterns and ocean currents fit into climate change models, but the mass media do not make much of the connection. This form of denial serves to put off individual and collective action, and assures that overwhelming climate catastrophe will have to hit millions more people simultaneously for there to be any unified response. Trying to look on the bright side must not depend on ignoring reality. Therefore, accepting unpleasant and deadly change to human habitats needs to be part of a strategy to overcome threats of climate catastrophe and other consequences of too many industrialized consumers. Living as if there were no impact to future generations is unfortunately enshrined in the materialist, individualist belief system. No longer putting off transformation, by closing down fossil-fuels - too much to ask? No one in his or her right mind wants to see humanity stumble on a mass scale and fail to feed millions of desperate people. But denying trends and the consequences exceeding ecological carrying capacity only assures a worse collapse. So there is a choice before us that is being swept under the rug, if considered at all: we end fossil fuel use now, or see it end for us involuntarily as basic systems fall apart. The loss of life would be far greater in the latter choice. If these choices were to somehow make it to public discussion, that would be miraculous. There are a few powerful people who don't want that conversation to happen, so they foster fear as a distraction. So we cannot foresee in the near future open debate on weighing a terrible disruption now versus a much worse one in the form of ultimate collapse. But we may come up against the terrible choice much sooner than even climate scientists and peak-oil watchers can anticipate. Still, it is unlikely that consensus on inevitable collapse can materialize. The mere act of speaking of planned disassociation from life-giving petroleum, versus sitting by until its demise (along with a livable climate), can be attacked by well-meaning people as heartless and needlessly pessimistic. Yet, for those willing to open their eyes and see, there are simply too many humans struggling through manifestations of overcrowding -- income disparity, loss of life-giving land to live on, cancer and other "civilization diseases," and wars. As these symptoms persist and multiply, any die-off from food shortage or devastating storms, for example, will immediately be blamed on you name it: terrorists, the "1%", the Republicans, Obama, China, etc. Taking stock of the downward spiral of ecological health may remain for a bit longer the pastime of the few who are paying attention to the big picture. I have no plan for widely presenting the choice between giving up today's dependency on massive fossil fuel (and nuclear) power in favor of avoiding total collapse as a result of waiting. So I put this choice out to you and whomever you might share this question: do we take painful action in a conscious way today, or see our window of opportunity disappear in order to get along in a false system of values? Western Civilization concerns itself with unbridled growth and exploitation -- while assuring as many gullible listeners as possible that mistakes are all in the past. Today's unprecedented crises, of course, are the price of triumphant civilized living and technical knowledge. We need to give up on a dysfunctional system and the dominant culture of mastery over people and nature. This means going further than demanding reforms, such as requiring television weather reporters to mention global warming as the cause of increasingly extreme storms and drought. This was the main point of an excellent new report by Amy Goodman on Alternet.org regarding weather and climate change. 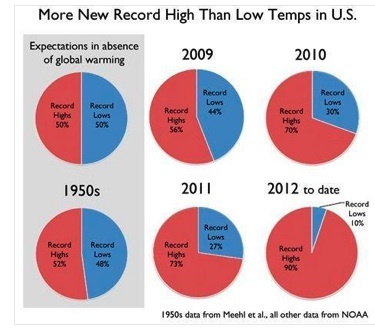 Missing was the point that the impetus for global warming is in the pipeline; what we see today in extreme weather from warming is only the result of greenhouse gas release of a few decades ago. The delay is forgotten or suppressed by those wedded to the status quo, but known to students of climate change. It is time to turn off the televisions and shut down the entire pollution infrastructure as rapidly and as compassionately as possible. To return to the challenge of connecting our own health and well-being to our Mother Earth, perhaps there's a simple demand: just as many today have rejected factory-farm food, genetically modified produce, tainted water, etc., many could also say "Shove it" to ecosystem predation and the denial of what seven billion of us are doing to use up Earth's life-support systems. It must not be too much to ask: good health for our bodies and the whole Earth. Occupy one's health, Occupy a healthy planet. Healing needs to be foremost, for both our toxin-ridden bodies and our increasingly toxic, radioactive Earth that will only get out of balance further if we allow it. Totally, That's all I have to say: totally. That's all I have to say: totally.